In an interview by PC Perspective (Via Sweclockers.com) Nvidia employees reveal that green has absolutely no plans to support FreeSync. This statement should put to rest all rumors of whether Nvidia would support DisplayPort Adaptive Sync regardless of the fact that it is a direct competitor of the G-Sync proprietary standard. There was originally some confusion as to whether DisplayPort Adaptive Sync would become a standard, non-optional feature but that would not appear to be the case. So far Adaptive Sync was an optional feature of the Display Port 1.2a standard. Now here is the interesting thing, Display Port 1.3 specification is already out. It is an optional feature or a permanent one with 1.3. It would be a pretty big win for AMD if VESA admitted Adaptive Sync into the permanent standard since then Nvidia would only have the option of disabling it via software . Last year at CES, AMD demoed FreeSync technology for the first time and this time around, they are showcasing the tech with design wins from multiple vendors, the biggest of the lot being Samsung and LG. 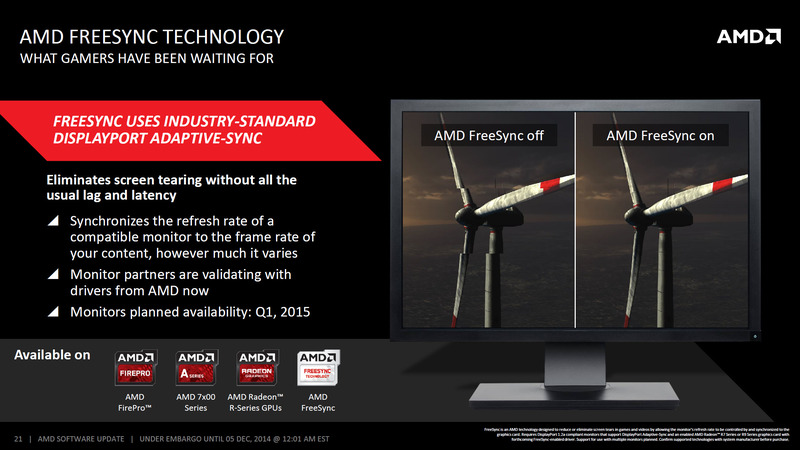 A total of 5 Manufacturers are currently (publicly) on-board with FreeSync: Samsung, LG, BenQ, Viewsonic and Nixeus. Nvidia’s G-Sync and AMD’s FreeSync are technologies aimed at eliminating the obstacles faced by current display technologies. With this tech, you should be able to view a very low fps or very high fps output without it having stuttering, delay, tearing and much more. Basically, something that should have been common place by now but really isn’t. From now on however, both titans have cast their dies and its the market that will dictate who wins now. Market sentiment is an extremely powerful factor in the success of any product especially ones so similar. Both techs are similar in nature and I would be surprised if one was obviously superior than the other. This means that it will be mostly market inertia and volume of goods moved that dictates success. AMD has promised around 20 different monitor models by March (priced cheaper) while Nvidia has a handful of monitors in the market right now (priced higher). If FreeSync gains enough traction then VESA can eventually move to make the standard non-optional, turning the tides with the standard proceeding 1.3.